It’s a fork, it’s a spoon – this product is great! So great, my kids fight over who gets to use it at EVERY SINGLE MEAL! 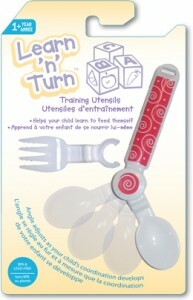 The award-winning “Learn ‘n’ Turn” Utensil from Transcontinental Trading Inc. was designed by a Kitchener area dad and is the perfect tool for little hands learning to eat. It’s much easier for small children to use because the end of the utensil rotates and therefore, is ALWAYS angled towards the child’s mouth. 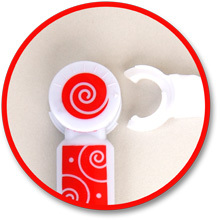 As a child’s wrist develops, mom or dad can rotate the end of the interchangeable utensil to the perfect angle! 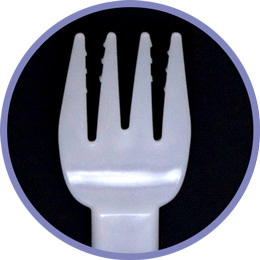 The fork attachment has small grips to hold food on tines better. YAY! Fewer messes and a happier baby! In May 2010, the utensil was awarded the influential PTPA Media Inc’s Seal of Approval for excellence in family products. Want to make sure your toddler gets their turkey dinner in their mouth? Send an email tojill@londonmoms.ca with LEARN in the subject line to stuff your toddler’s stocking with a free Learn ‘n’ Turn utensil! Tell me the name of the dad who invented this tool (hint: it’s on the website!) and your username. Contest closes DECEMBER 9, 2010. Today is day 11 of the LondonMoms 12 Days of Christmas! Remember that all review contest entries will be submitted into the Grand Prize draw at the end on December 10, 2010. This entry was posted in Contests, Mama's Got Swag, Reviews. Bookmark the permalink.